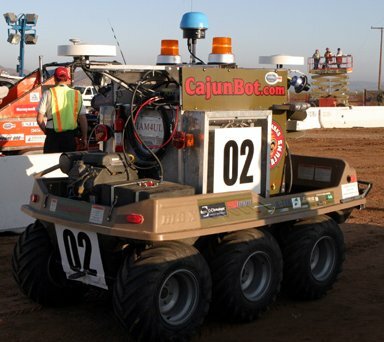 "CajunBot was seventh to get out of the chute. Of the six ahead of it, only two were still running. The bot immediately after CajunBot sped out of the chute but shortly therefater flipped over." 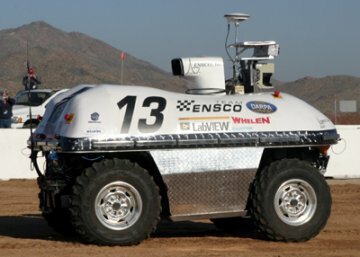 Okay, so none of the unmanned vehicles completed even 5% of the 142-mile course. It was still cool and IT Conversations' first-ever live sporting event! With virtually no advance notice more than 250 listeners learned about us over the course of the day through word-of-mouth and a few blogs. Some sent email from as far away as Germany and Latvia. As one of our geeks-with-cellphones on-the-scene reporters, Soren provided hundreds of listeners with this post-start overview of the race. Jim's firm handles PR for Team CyberRider and he called in during our show to discuss his client's vehicle and tell us about the problems so many of the teams were having with sensors. We interviewed Warren Williams from Team Phantasm. 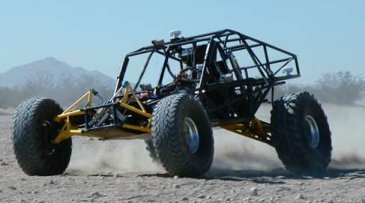 Their vehicle was designed like a ladybug; in fact its name is Ladibug (Long-range Autonomous Directional Intuitive, Boundary Sending Unmanned Ground Vehicle)...Ladibug was "swarm" enabled. 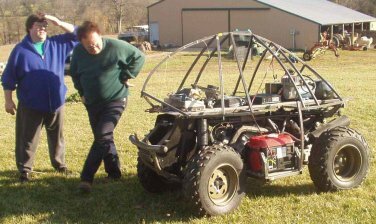 Warren was explaining to the crowd that Ladibug could detect other "swarm" enabled vehicle and communicate with them to assist in force coordination on a battlefield. The team's vehicle didn't make it to the finals, but you'll learn a lot from these "car guys." Dann Sheridan and Doug Kaye interview Chris "CJ" Pedersen, the team leader and project manager of A.I. Motorvator. Team ENSCO made it to the finals, one of only 19 entries selected from the 106 applicants. Team ENSCO is one of two Virginia teams selected and one of only five total East Coast teams participating. 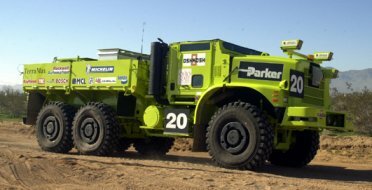 Based on a massive chassis from the Oshkosh Truck Corporation and the computer/sensory technology from Ohio State University, TerraMax is the monster truck of Grand Challenge vehicles.